For anyone who requires vision correction to see, one way to go is with a prescription mask. If you normally wear glasses, it makes the best sense. If you’re normally a contact lens wearer, it can be an option, as well. I have previously always worn contact lens with my mask until this year. I wear my glasses most of the time now as my contacts just can’t adjust perfectly to a bifocal prescription. They simply aren’t as good so, I decided to try a prescription mask. Now, I don’t have a difficult prescription so stock lens and masks that they fit in are readily available. I saw them first in a scuba store in Key Largo, Florida. When I did a search online there were several sources for them as well. There are sites that will even do bifocals although they are a custom order and more money. As for my new mask with prescription lens, I loved it. I’m really glad I gave it a try, I could see everything better than with contacts and a regular mask. Other ways to add correction to your mask include a few different kinds of inserts. The first is simply a reading (+) power for far-sighted usually no more than +3.00. The second is a custom set of lens that are framed and mounted to your mask with a small suction cup. 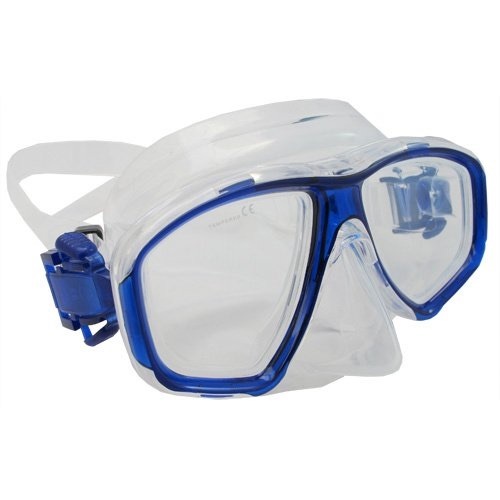 These require the right sized mask to accommodate them, too. The most expensive option I know is through your optician. These are custom made as well and provide the best vision correction possible. So, if you have an easy prescription, It’s a great time to try a prescription mask. There the most affordable ever, I spent $47 delivered! It’s always good to have options.